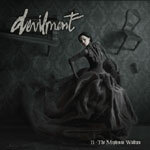 II - The Mephisto Waltzes is the Cradle Of Filth leader Dani Filth's second album with his side project Devilment. Frankly, his main band never was something that I enjoyed the least, so to me personally this particular record is by far a greater experience than what I've heard from him before, even if it does lack a bit of diversity and the songs follow kind of a given pattern all along. It's certainly heavy and dark from start to finish, yet not performed in a slow tempo, like quite a few records are in that type of music and Dani's gloomy vocals and Lauren Francis' clear tone function well together to give the record a somber and sorrowful posture. It contains a lot of songs that are both mysterious and intriguing, which keeps you attentive for the most part, and it feels like an eerie veil enfolds the whole thing. It's a very even record and sometimes that's a somewhat unfavorable outcome since you need kind of a bland or a dull song to distinguish the nuances between the good and the bad over the record. It's in my opinion definitely a fairly good record, but alas, it doesn't contain those individual killer songs that we're all looking for and consequently it's unable to really grab me by the balls more than occasionally.